Black Friday is just around the corner. Secret Black Friday sites are starting to crop up again and are already getting hold of some unofficial ads. 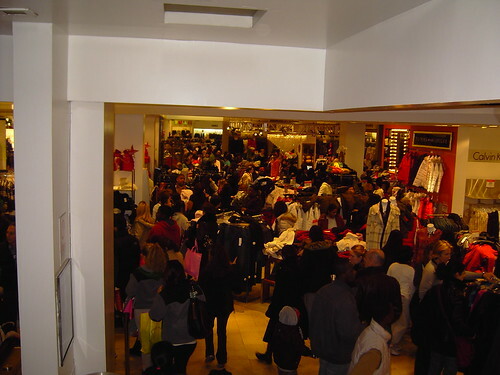 I thought this would be the perfect time to give some tips about Black Friday so that everyone can have an enjoyable and safe shopping experience during the mad rush that is The Day After Thanksgiving Shopping, better know as Black Friday. Prepare for the trip ahead of time. Black Friday is a madhouse. You won’t be able to just browse through the different isles and find what you are looking for. The best thing to do is create a list ahead of time, scout out the store a few days earlier and know where things are most likely to be. Map out where you will go first and prepare to be bombarded by people while trying to get your things. You may be asking, “How can I create a list when the deals are only revealed the weekend before?”. We live in the information age, and do you really think employees or others that know the deals are going to keep quiet? There are tons of sites that appear around the end of October that have gained quite a following. These sites get their hands on ads early one way or another and publish them online so you can better prepare for the day. They aren’t always 100% accurate and some retailers have even put out false ads to throw these sites off, but they will give you an idea of what will be available. Get there early! Most of the big ticket items you will find during Black Friday will be in limited quantities at each retailer. These items are obviously the most prized and more people will be after them. Needless to say, if you get there after daybreak, you will probably never see these items. If these are on your list, take a nap the day before then scout out the location you plan on shopping at around midnight. See if anyone else has lined up already. If no one has, you can probably take a few hour cat nap and go to the store around 2 or 3am to get in line. Usually around an hour before the store opens, an employee will come out and pass out vouchers to the big ticket items to those at the beginning of the line. This voucher will allow you to purchase the big ticket item, as long as there are still some in stock. Some years, there will be more vouchers than actual products in stock so again, get there early. When you enter the store, leave the cart behind! Don’t think that having a shopping cart will give you an advantage over the swarming mobs because realistically, the place will be so packed with people, you and many others will have to abandon the shopping cart due to blocked isles. It’s better to be quick and nimble in this situation, forget the cart and just grab, guard, or set up camp around the things you intend to purchase. Some of the bigger items you will need store employee assistance to get such as a big TV or heavy computer set up. Don’t leave these things alone thinking they are too big for someone to swipe out from under you, I have seen this happen. Bring a buddy with you and have them go for assistance while you watch your items. Don’t wait till Black Friday to look at the deals. I’m not talking about preparing for Black Friday as some retailers will have special pre-Black Friday deals. I’m not sure what the reason is for this, but some of the deals are even better than some offered on Black Friday. In fact, Saturday, November 8th there is a pre-Black Friday sale at Walmart featuring some pretty decent merchandise. The best of this sale is probably the Compaq laptop for under $300. It’s not the best laptop, but it is definitely worth more than the price. Buy online! Some online and hybrid retailers have the same deals online. You can get the same price and item without ever leaving your home. Some require the item be shipped to the retail store and picked up, but it’s worth it to avoid the crowd. Black Friday has been around for years but last year, it’s history gained a black mark. An employee at a Walmart on the East Coast was actually trampled to death by people trying to get in the doors and snag the big deals. This is a pretty sad occurrence and you need to be careful when entering, guarding or even waiting in line during Black Friday sales. There are some crazy people out there and if you think road rage is bad, it is nothing compared to angry Black Friday shoppers who got up at the crack of dawn and are looking to score big. Don’t bring small children on Black Friday. If you want to come and have kids, try and find a baby sitter. Even younger teens should be careful when coming to Black Friday. Good tips! I think I have gone a total of once to shop on Black Friday, but I didn’t go early and I wasn’t looking for any big ticket items and I discovered that if you aren’t, it is so not worth it. .-= Amanda´s last blog ..Day 5 & 6: St. Maarten and St. Croix =-. Get there as early as possible. Take a nap later in the day because the stores will be packed as early as possible. Another tip, employees will set aside good deals for themselves, even though its not allowed by the store policies. That’s why there are more vouchers than actual items! Amanda, I totally agree, if you aren’t there for the big stuff, most of the little things you can just buy online, or even after Black Friday. The big things are usually worth it, but its an ordeal for sure. Right on Craig, sleep takes a back seat to savings 🙂 the earlier you get there, the better. I’ve found some people will actually abandon some bigger stuff if they feel they got too many things, so some of the big stuff can be scooped up later if you stay long enough and pay attention. I use to do the Black Friday thing in high school, but it’s too darn stressful. You only really can go to one store because by the time you make it to the others everything is gone. I’ll be sleeping come Black Friday this year. .-= Ninja´s last blog ..Being dumb is a good thing =-. I agree, it is stressful and I have never done multiple stores. This year there are a few things I need that just happen to fall into the Black Friday category but I will just walk in around noon or whenever to the store that’s offering what I need and see if it’s there. If it’s not, no biggie because the deal isn’t super great anyway. Hey, here are some online sights that were listed in Family Circle Magazine as the best places to shop. PriceGrabber.com, Shopzilla.com/BizRate.com, NexTag.com, Shopping.Yahoo.com, and Shopping.com/DealTime.com. Happy Holidays! Thanks for those, Mother. I always try to do all my shopping online and these are good places to check. It was the first year of the big price cuts for LCD and Plasma TV’s, Best Buy had a great deal on a 42inch LCD for $1000. Got up early, waited in line what seemed like forever, and when I got in, GONE! Then I started thinking, maybe if I shopped around a bit I could get a good deal that wasn’t necessarily advertised. Ended up going to Sears, talked to the salesman, and ended up getting a 42inch Plasma for $1000. This price was not advertised at all as far as I know, regular price was well over that. Turned out getting a great deal without even needing to stand in line. If you love saving money as much as I do, never hurts to ask! .-= Jake´s last blog ..Do not get ripped off by credit consolidation con artists =-. Jake, you’re absolutely right, it never hurts to ask around. It’s usually best to ignore the hype too because on many occasions it’s unwarranted and you can find the same thing elsewhere or at a different time. Thats part of the marketing strategy, make a sense of urgency so you will overspend. Jake on Is Auto Assure a Scam? Jake on Amazon Prime Review – Is It For You?